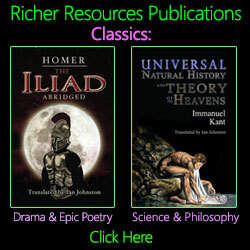 Richer Resources Publications is an independent publisher dedicated to producing dynamic and intelligent books for the discriminating reader. High-quality in form and content is the distinguishing feature of Richer Resources’ volumes. They produce books in a wide variety of genres, including classic titles in translation, gift books, art books, poetry, finance titles and children’s books. They also produce art prints and greeting cards of both classic images and modern, contemporary works. Classic authors include Homer, Euripides, Sophocles, Aeschylus, Aristophanes, Ovid and many of their best-known volumes. Machiavelli and Goethe are also represented here. Modern poets are also offered, including Kevin Taylor, whose book “Between Music & Dance” is both playful and thought-provoking and “Insectomania” by Sally Zakariya, in which she sets forth observations pithy and sometimes somber about the lives around us we barely notice – except when annoyed! As an example of how broad RRP is, right alongside the great Greek classicists, they publish a 10-book set called Phonics Readers, for teaching young children how to unlock the magical world of words and thoughts on paper.